The future for global fisheries is not rosy, aquaculture offers false hope and governments should be setting aside up to half of fishing grounds as marine reserves to ensure the future of sea life. That is the line from fisheries expert Professor Daniel Pauly, of the University of British Colombia, whose visit to New Zealand this week is sponsored by the Department of Conservation. Professor Pauly also advocates the end of all bottom-trawling, which he says is incredibly damaging to the ecosystem. The university's Fisheries Centre in Vancouver, of which he is director, maps catches globally, by species and area of distribution, collated with catch landings. As demand increases, so does price, making it economical to go farther afield and deeper, especially in the Southern Hemisphere, given that the north is now so badly depleted. A computerised vision of fisheries activity would show it spreading like a skin disease, Professor Pauly says. "What we're doing is taking fish from one area then moving on. It is not sustainable. There are fewer areas to move on to." Commercial fishers target the biggest fish first. As those decline, they go for the next-biggest but in doing so also catch the juveniles of the species they were previously targeting, which precludes any recovery by the species at the top of the food chain. 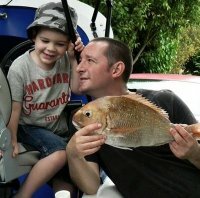 Though New Zealand's fisheries may be in a better state than those in other countries, and the quota management system allows some control, Professor Pauly disputes the premise of Maximum Sustainable Yield on which it is based. The New Zealand Fisheries Act requires the minister to set total catch quotas at the level which will ensure individual species stocks are maintained at existing biomass. What that means is that the industry catches juveniles that are schooling because that takes the least effort and expense. Professor Pauly says scientists may be able to show that fishing to MSY is most productive under existing circumstances, but the theory does not consider what the oceans and fish stocks would be like under pristine conditions. He cites the international agreement on southern bluefin tuna, the most prized fish at the Tokyo markets. Catch levels were set based on catch records from the 1980s forward. "The Japanese were not interested in looking at old data on southern bluefin because the figures would have suggested the fishery be closed." Professor Pauly says we forgo the benefits attainable from an improved fishery by never allowing the stocks to recover. "While you are fishing, all species are in decline. You cannot fish 'clean', you never get only the fish you are targeting." Much of the fish taken as bycatch is thrown overboard or ground up for meal because it is not high value. Technology is allowing man to go farther and fish deeper so that areas once protected by weather or depth are not any longer - think Antarctic toothfish. "The size of stocks produces pressure for feeding so fish move to shallow water to eat. We catch them. But now we've caught all the shallow-water fish so we go deeper. The fish don't come into the shallows any more. "We know exactly where the fish are, we can go to the last deep canyon and catch the last mature female laden with eggs - that means we have to have marine protected areas." Professor Pauly says a badly reduced fish stock would require 50 per cent of a country's fishing grounds to be declared no-take in order to precipitate full recovery, especially if there was still to be some catch. If stocks were not badly reduced then 20 to 30 per cent might be enough. His view on New Zealand's system: "ITQ [transferable quota] reduces expansion of the fishery but the fishery cannot be said to be sustainable because all species are being fished down. You have to consider the ecosystem as a whole." We will become more aware of the global problem, he predicts. In Northern Hemisphere markets, people have plenty of choice but often it is not the fish they know, the ones they grew up with. It comes from overseas, from the Southern Hemisphere, from deeper waters or from fish farms. "Aquaculture uses huge quantities of anchovies and pilchards - this doesn't help the recovery of other species." China is a major fish meal importer and the increase in Northern Hemisphere farms is dragging resources from the south, Professor Pauly says, in a way that cannot go on endlessly. Fisheries being commercially exploited decrease at around 10 per cent a year, he generalises. Since the late 1980s the world catch has been in decline. And now there is increasing pressure because of population and health advice recommending fish. Professor Pauly suggests action now. "It's when you get in trouble you need drastic action." There will be some pain as commercial fishermen lose jobs and companies lose income. But it will be short-term pain for long-term gain, he maintains. Professor Pauly sees little progress in terms of repairing the damage of the past century, despite international fisheries agreements. "There is some awareness that change is needed, but no agreement on how that should be done. Actions are not following words. "It's like global warming - everyone agrees it is a problem but China is using more and more coal and the United States is making noise but not moving. Non-destructive fishing gear would be a big improvement, he says. "In the long term, bottom trawling will have to be phased out." Despite fighting a battle that appears to be endless, Professor Pauly does have hope. "The seas can recover. Life invades everything if you give it space. Stop weeding your garden and see what happens." Commercial fishing, which has already ruined fish stocks in the Northern Hemisphere, is set to do the same here. New Zealand's quota system is better than nothing but still does not allow fish stocks to recover. The only way to do this is to stop fishing - by setting aside between 20 and 50 per cent of our fishing grounds as marine reserve. * Professor Pauly speaks tonight at 7pm at Auckland Girls Grammar School. Did anyone know that this professor was speaking tonight? "Commercial fishing, which has already ruined fish stocks in the Northern Hemisphere, is set to do the same here. " I doubt that. I agree with his comments that MSY is not really a suitable target, but a number of our fisheries are rebuilding. The sky is in fact, not falling!! Whenever I see such an extreme extension of an argument, it is like a red flag notifying me that someone is politicking and not speaking the truth. This is just yet another person playing on the public's ignorance of fisheries management, a public that has no idea that some stocks are being rebuilt, a public that is too quick to believe that since other countries have rooted their stocks, we are doing the same. It is disapointing to see generalisations from overseas applied to NZ, particularly with sensationalised intro paragraphs mentioning 50% reserves. I reckon that is scaremongering and most unhelpful to the cause of marine reserves. Auckland: Tuesday, 17 August, 7.30-9.30pm, Auckland Girls Grammar School Auditorium, Howe Street. Wellington: Thursday, 19 August, 6.30-7.30pm, Lecture Theatre 1, Rutherford House, Victoria University. Christchurch: Friday, 20 August, 7.30-9.30pm, venue to be announced. Kaikoura: Saturday 21 August, 7.30-9.00pm, Whale Way Station. This bloke is already featured in the 'Interesting Stuff' thread on the 'Reserves' forum. Contains the dissection of his views by Floor Anthoni. You lads have a habit of speaking your mind, and that's only fair; I've spoken mine, publically, for quite some time, and have been shot down on numerous occassions for it. I'll put my neck on the line and vote in favour of reserves, and on a moratorium on fishing in new grounds (bottom trawling), as advocated by 1000+ pointy-headed pencil-pushing scientist types, and a swag of conservationists. I'd like to enter into a debate, and I'm not trying to make anyone see my point of view, but I don't want to lock horns with anyone (that's futile). great to have you onboard Steve...I am sure in some scenarios "we" can agree to disgaree all adult like and maybe even learn a little bit as a resource of knowledgable folk. I think you will find most here are not against the concept of "Marine Park/Reserve" but the process that DoC are going about "dictating" policy is what gets our backs up. Ta Kerren. I'll have a think about the next post (will compose it, when I have a little more time up my sleeve; things are rather chaotic at present), and will go from there. Yay!! A partner in arms has arived! Sound the trumpets! We would all very much like to be better informed of things piscatorial, but due to time involved in finding out the facts, and poor distribution of facts about fisheries to the general public, we often struggle. So, your input in any of these discussions would be a fantastic way to educate some of us non-pointy heads. And maybe you can do a better job than I of convincing some of the idiot-stick wavers that we should be supporting reserves! And maybe you can do a better job than I of convincing some of the idiot-stick wavers that we should be supporting reserves! I reckon I'm playing my part in natural selection. The big ones I shoot can only be dumb and blind, because I am basically useless. Therefore, I take out the bad genes and the superior genes have a better chance of survival. Long John, however, has some skill. Therefire, he should not be allowed to shoot snapper over 1 kg, because it's not fair on the stocks. never listen to a canadian. never listen to a diver. And then there were three. Yipee. I, BTW, have no skill. My 'success' is a function of time in the water, that's all. My CPUE is lower than anyones. Prime breeding stock-I'm not so sure. You would need many, many generations of poor parent stock to make a significant difference to the genetic strength of the population esp. with fish. If you ask the average Joe in the street about marine reserves they all conjour up pictures of Goat island , glass bottom boats and handfeeding the fish , marine reserves are always going to be a vote winner. Especially when real estate agents add " Has stunning views over..."
Point here is that the creation of reserves are not IMHO the panacea they are made out to be. If we could rark up ARC about sediment discharge and road runoff would we still need the reserves. Lets face it if you were a fish there are a whole lot more attractive places to be than swiming in mud and road oil. Forgetting for a moment about any taking from commercial or reco fishers , would we be in this position if the local marine enviroment was not is such a poor condition. Is the discharge and runoff problem one that goes straight to the too hard and too expensive basket ? Are marine reserves DOC's attempt to be seen to be doing something instead of addressing a bigger issue ? Why does the answer to all government problems involve taking more of my money ? Stop shooting all those prime breeding puka and orange roughys. By the way, exactly how many snapper would you have taken this year in total? Goddam spearo's are ruining the ocean. I say.